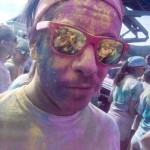 On Saturday September 21st Color Me Rad was hosted in Altamont, NY. 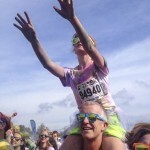 Here are a few pictures from the run that some friends and I took part in. 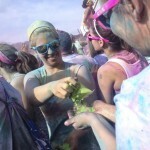 Saint Rose student, Jessica Parker, celebrates her finish during a color bomb. A father holds his daughter above his shoulders to help her catch a color packet. One runner shares some of her color packet. 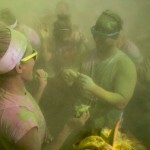 Two runners open their color packets. 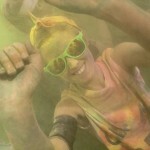 Saint Rose student, Joe Lancelot, is covered in various colors from the color bombing after his run.